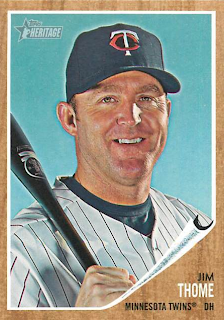 Jim Thome, the newest member of the 600 Home Run Club, has accepted a trade from the Minnesota Twins back to the team he started with, the Cleveland Indians,. The Indians hope the addition of Thome will help them overtake the first-place Detroit Tigers in the AL Central. Thome had to waive a no-trade clause in his contract so he could return to Cleveland. This comes at a time when the Indians have lost six of their last seven games and have had to endure a series of injuries. Currently, only two players who were opening day starters are healthy enough to play. Hopes are that Thome will be able to step in for designated hitter Travis Hafner, who was put on the disabled list August 22nd and may need season-ending foot surgery. The Twins waived Thome on Monday, the day Hafner was put on the DL. Cleveland put a claim in for Thome on Wednesday, two days later. Once the Indians were awarded Thome, the clubs had 48 hours to work out a trade. As part of the final deal, the Twins will receive a player to be named by Oct. 15. Thome spent 12 seasons with Cleveland from 1991-2002, hitting 334 homers, a team-record, and helping the Indians get to two World Series. He signed with the Philadelphia Phillies as a free agent in 2003, leaving Cleveland for a six-year, 85 million dollar deal. It is anticipated that Thome will arrive in time to be in the Indians' lineup Friday night.